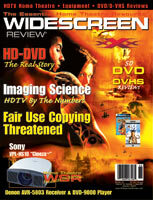 I started with the Ultimate Widescreen DVD Movie Guide and haven’t missed an issue since. I thought it would be nice to have a good resource for DVD reviews, but it’s turned into so much more. It’s to the point where if I don't see certain segments in the mag (new products, one installer, etc. ), I feel a little disappointed. Please keep up the great work.